Scariest Boo Costume | 2P START! You could even say this costume has the power to leave one paralyzed with fear… There was some discussion as to whether or not the masked Boo should say “Woo-hoo!” as a play on the traditional “Boo!” – but something about it never quite sat right. I never realised… It’s obvious really when you think about it. Any way, 10 days until halloween. You guys should get a licensed Lace costume out there before then. Simple yet clever. Good job, guys. I really love the job you did on the scared Boo, Ray. The combinations of gradients and transparency. On the line art, especially! But… Is that a ctrl+v’d screenshot of SMW in the background? Oh, okay. I can live with that. What does that suppose to mean? Took me a second to figure it out, but after that I lol’d, you’re comics just get better and better! HOW DO YOU PEOPLE SEE THESE SMALL LITTLE DETAILS. But seriously. Nice comic. Nice Halloween theme and the fact that you went through the effort in your art to put that in is amazing. I bet you didn’t think anybody would find it but hey I guess Kvb showed you wrong. I got excited by the Yoshi’s Island boo on the front page and I love the logo, but the comic was a let-down. It was either too simple for me or I’m missing something. That’s both hilarious and adorable! Well, maybe not completely hilarious in that exact terminology, but clever, witty, and…did I mention adorable? I don’t think I did. I loved finding all the small, hidden details in the picture this week. The ones like how the boo on the left is wearing a Mario mask. It’s kind of hard to see, but if you change the brightness of the image a bit, the thing on the right is also a Boo! Oh gosh, that face Boo is making. Ray, I bet you just love to have cute puppies and Boo-you’d-want-to-hug in the comics (regardless of what Tim is suggesting), just so you can draw them. Loved it! Small, direct and it just fits. Yet another NCG. short and sweet. Also i wuld like to make clear my My musical misfits suggestion if you copy paste “La-Mulana OSV – Mr. Explorer” it to youtube search it you will find it no problem. As always keep it up. I love how you turned that around. What happens if the boo wearing the mask look in a mirror? Does he just stay frozen in front of the mirror for the rest of his life? I’m going to guess that they’re like vampires and they don’t see their reflection. Also, the boos were quite friendly in Paper Mario, so not all boos hide. Only the evil ones. I never assumed that was them being scared of Mario or whoever, I just assumed it was a defense mechanism so Mario had a hard time hurting them. Eh. Sorry. Wasn’t that funny to me. Maybe because I’ve seen it done before (if you want to know where, it’s here). Yeah, even though the “Boo is scared of faces” joke may have been done, this puts a different twist on it that as least I haven’t seen before. Okay, well I didn’t really see much a difference from a Boo wearing a Mario mask to a person wearing Mario glasses. At least not a large enough difference to make it funny the second time. But yes, at least you guys update regularly. I agree, it just wasn’t that funny. I honestly find the Fanboys comic funnier. But in terms of visuals, 2P Start takes it. But here we actually get new comics! Yeah, they update less frequently then VG Cats. Now I want a Mario mask for Halloween. In b4 “There goes Comment of the week”, even though podcast 100 won’t come until later. I went as Mario for Halloween once as well. At some point I took off my hat and some random guy saw me in the overalls and red shirt and assumed I was a train conductor. Am I the only one that thinks that logo is really freaky? About the comic, it’s a little early for Halloween IMO, unless you have another idea that is also Halloween related for next week. I thought it was clever, but not great. Do boos go trick or treating? 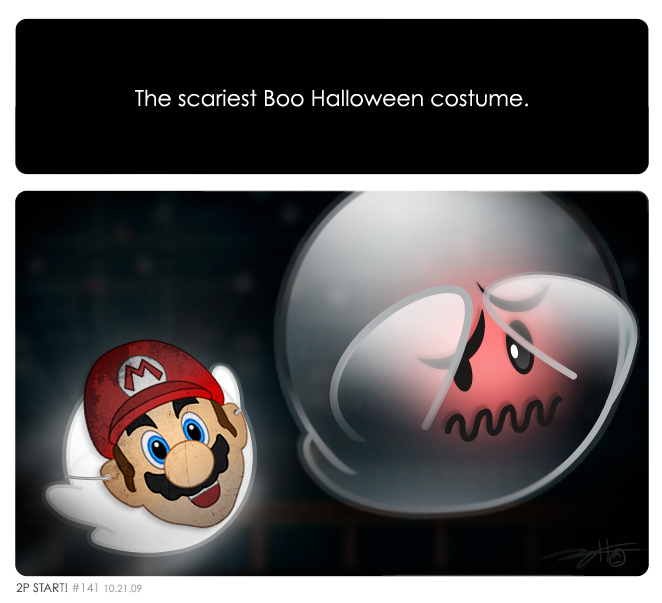 If they do, then there should be a second boo costume…one with a Luigi mask. I know that it isn’t the same, but that’s why the second boo would have a Poltergust 3000 for candy, or whatever boos give out for that. BTW, what’s Lilly going to be doing for halloween? Augh, so much scrolling! Geez!! Ah jeez, didn’t see that one coming! The super-secret preview made me think Mario might be the one calling Ray. Or Sonic asking if he was going to pick up his new game. Anyways, I love how after the forty-something panel and last week’s panel-satire comic, you do a comic that only has two panels. Press the spacebar and you pretty much pass over the whole thing. Gentlemen and ladies, hold on to your goodie-bags. Because this costume is not your boo’s father’s Halloween costume. It’s literally a hauntingly good mask, that’ll make you want to say boo. … This is the reason why I never write scripts. Good comic, guys, good comic. Hahaha….Reggie mask! That one would scare me! That was LITERALLY a great comment. Heh heh. Maybe the Reggie mask can come with a cardboard Cammie cut-out? Cammie: Oh, isn’t this just frightening? I’d be much more scared if my arm wasn’t in so much pain. Would you let go of my arm Reggie? Say, you don’t think Reggie reads these? – Great attention to detail (as usual). – I loved the expression on that Boo’s face! A topical comic! Horray! And it was pretty good too. They have Lace. Not quite a mascot, but darn close. And if there was a shirt that had some witty dialog between Tim and Ray on it (knubby elbows and all), I could see myself buying that. Wow, NCG. I loved the scared boo’s expression- great artwork! Also, imagine a “Black Doom” mask to scare TimMii and DoRayMii. Boos go Trick or Treating? Or do they just go Tricking? And just for a change of pace, how about taking the Boo w/ Mario Mask and making it a shirt design? That way you can always be free of those pesky Boos. Ha, that was a pretty good comic…NCG! I like how it came across as such a simple idea and only required a single panel to get it across. To that end, I’m curious to see whether you think getting rid of the first panel would have made the joke more involved, as opposed to telling the audience that it’s a costume…just out of curiosity. honestly though, nice execution! I’ve been following the comic for a while now, I cant remember the first comic I read from 2pstart though. I’ve also watched a majority of the pod-casts 1-20 and 70 – 99. I should probably watch the rest of those. Anyway, This comic is great. Simple, short, and funny. I need to remember to bring a Mario mask to ward off boo’s on Halloween. I’ve always appreciated the art that’s put into these. This art is probably the number 1 on my list for quality. The jokes are nice and clean too and that’s kind of a rarity. Thanks Ray and Tim for making completely awesome comics. I’ll keep reading 2pstart till one of you dies… or quits… whichever comes first. Anyhoo. I guess I might mention that I just rose from my grave. I was lost but now I’m found. Nice comic guys, short but sweet. Must be taking a break from all those finger sprainingly long comics to bring us a nice little gift of comedy… that or you guys were too lazy to make a more lengthly sized one haha. Though, dare I ask why the mask looks like it has a sort of “old movie fuzz” look to it? Seems the Mushroom Kingdom doesn’t have the best of markets for Halloween costumes. Though I suppose it beat the “wearing a plastic, malformed, overly high-gloss, colored, with eye and mouth holes in it plate to your face” look we know all to well. Nice comic guys! Really short this week, but the joke was pretty clever. However, I’m not a huge fan of those 1/4 panels that show up from time to time. Wallpaper, maybe? I don’t need to say which panel, do I? BTW, am I the only one that dislikes this comic? It’s too short, and didn’t give my finger enough exercise. Anyways, still deserves a NCG. Oh, and I agree with blaster. Needs more panels. I mean, you’ve worked out our fingers for 2 weeks, and suddenly you give us a week off. We need to keep our finger strength up!
. Or maybe it’s ? I dunno. Gah, tags at the end of my comment didn’t show up. /sarcasm. Or maybe its /seriousness? I dunno. 2. use (ampersand)lt; and (ampersand)gt; for < and >, respectively. Just in time for podcast #100! I’ve actually been looking at your comics for probably about a month now, and I think they are very good. Actually, pretty great! To be honest, I didn’t really like it. The joke just wasn’t funy for me. The blushing Boo is adorably cute though! Why is all the Halloween stuff coming out now when Halloween isn’t until next week? You guys coulda posted this comic next Wednesday! First the Simpsons and now 2pStart. NCG. I took a second though, but very funny once I did. I don’t get it, but it’s now my new desktop wall paper. 1. You apparently have low standards for what becomes your wallpaper. 2. Have you never played a Mario game with boo in it? You are now my enemy. Any “person” who say i have low standards for making something 2pstart related is obviously EVIL!!!!! OK, let me clarify: I meant that you would choose to make your desktop something you don’t understand. Did the Boos do that in Super Mario Galaxy? I can’t remember. I know they did it in 64, but that’s the only one I’ve played where they’ve done that. I don’t remember, but I’d assume. Green hair…purple clothes…except the Joker looks legitimately like he’s going to kill you, while Stefan…I don’t even know…he doesn’t strike fear into the hearts of his enemies, that’s for sure. And to return to the original debate, compare that to Volke, who looks like he’s trying to count how many ways he can kill you before you can stop him. As for Super Mario World, I have played it, but not much. I’m not a fan of old 2D platformers. Or really anything with a lives system. lol, ya i haven’t play a Mario game since i played it on the SNES. But i like 2pstart as much as ray likes sonic. And CK, i didn’t mean it when i put people in quotations. It was a joke about the “internet police” episode of 2pstart live. So sorry CK. Don’t forget SMB3! That was the original appearance of Boos in the Mario universe. And frankly, I don’t get why people love SMW so much more than SMB3. It was a good game, but not leaps and bounds better than 3, and honestly, I’d rather play SMB3 any day of the week! I’m a Smb3 fan for life, I’d take Mario 3’s EIGHT powerups (counting p-wing and Kuribo shoe) versus World’s 4 (counting Yoshi). Kuribo’s Shoe doesn’t count; you only get that on one level. It is awesome, though. And if you want to count P-wing as separate from raccoon tail, why not count all FOUR types of Yoshi’s? Granted, Blue Yoshi blows the others away, but still. And the cape is the most awesome power up anyway. Numbers do not win a battle. Although if you count Starman, you should count the Yoshi Wings, so World is up to 9. And Cape + Blue Yoshi + any Koopa = so much awesome that it beats everything from SMB3. But aside from powerups, SMW has the Koopa Kids, Special Zone, and Chocolate Island. I mean, how can you beat an island made of friggin chocolate?! Sure, Big Island is pretty awesome, but it’s simply not made of chocolate. Mario 3 had the Koopalings too. Right, but didn’t they all use the same strategy? In SMW, they all have a different way to beat them (well, they come in pairs, but the second one is usually harder in some way). Their projectiles acted differently, and after one of the worlds, they shook the ground like the Sledge Bros. if you were on the ground. Mostly the same, but you can’t beat all of them using the exact same strategy. I’m with you on that. SMB3 is the best. No, Tim emailed me on Thursday. Maybe he’s boycotting twitter? Hey, who likes my home made 2pstart avatar. Would LOVE to see a HD version of this. It’d be my new wallpaper in a snap!